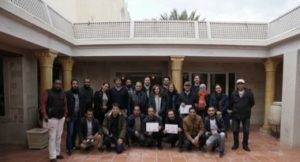 The aim of the advanced training phase (29th January – 10th February 2018) of the Training in Action project was twofold: first, to assess the progress of the mini-projects that the trainees have planned to do from August 2017 until January 2018. Second, to provide an advanced training for the selected trainees, by bringing all the different strands of training together (Survey, GIS, photogrammetry, condition assessment). The objective was to show how they can be integrated for a more complete documentation and assessment of the cultural heritage and how this would serve as a better basis for any decision making regarding the different aspects of heritage site management.